Railpictures.ca - A.W.Mooney Photo: A bit of high cloud did not dampen my enthusiasm for getting a shot or two of this train, a #432 from Fort Erie bound to Mac Yard. For there was a pair of cab units in there!! He was rolling along pretty good, and since I was using an old Anniversary Graphic camera this day, with 160 ISO Kodak Vericolor III film, I needed all the light I could get. Set this at 300 f4.7. 4×5 inch neg. Why 4.7? Because that was as open as this lens would allow. Compare that to the 2.0 or 1.8 on many of the SLRs of recent years. So this image was a tad on the dark side, but ‘modern manipulating’ bought it up to snuff and this looks not too bad at all. Power seen is CN 9400, 9177, 9175, 9508 and 4425. The old F units were not as common on freights as one might think. There wasn’t enough of them. | Railpictures.ca – Canadian Railway Photography – photographie ferroviaire Canadienne. 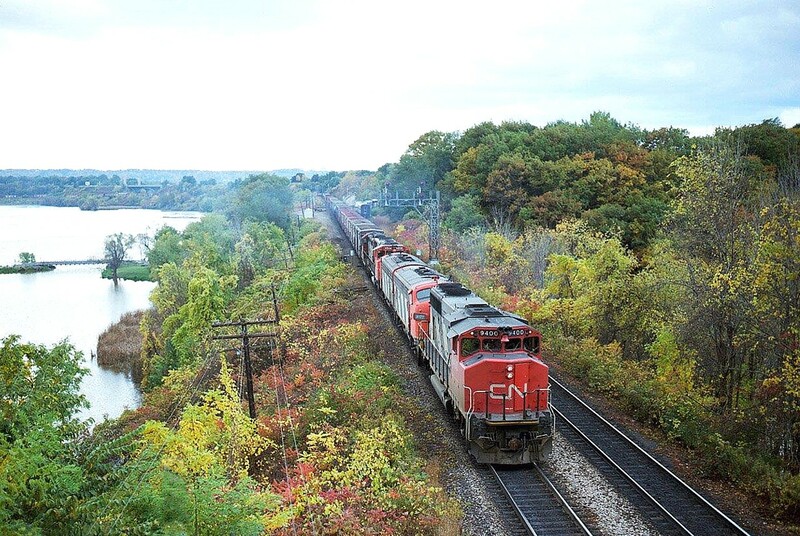 Caption: A bit of high cloud did not dampen my enthusiasm for getting a shot or two of this train, a #432 from Fort Erie bound to Mac Yard. For there was a pair of cab units in there!! He was rolling along pretty good, and since I was using an old Anniversary Graphic camera this day, with 160 ISO Kodak Vericolor III film, I needed all the light I could get. Set this at 300 f4.7. 4x5 inch neg. Why 4.7? Because that was as open as this lens would allow. Compare that to the 2.0 or 1.8 on many of the SLRs of recent years. So this image was a tad on the dark side, but 'modern manipulating' bought it up to snuff and this looks not too bad at all. Power seen is CN 9400, 9177, 9175, 9508 and 4425. The old F units were not as common on freights as one might think. There wasn't enough of them. Oh yeah, Steve.that, according to my notes, is VIA 6518 heading west. Don’t know train number. 432 was always great for power. One good unit and the dregs. Oh, Mr. Mooney – I see a third Cab unit and a passenger train in the distance rounding the curve…. I’m always amazed, even though I had seen it, how grown in Bayview had become. Now portions of it razed to shore up the Berm, and in a couple decades or even sooner, it’ll grow in yet again..